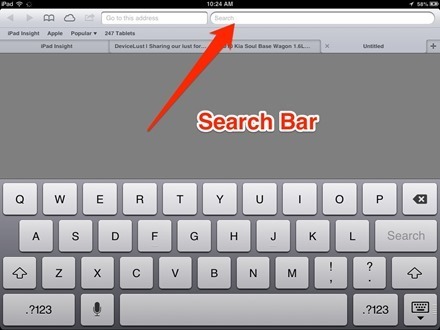 Private browsing is a very useful feature for the Safari browser app on the iPad and iOS. In private browsing mode your browsing history is not recorded. So, for example, if you’re secretly browsing around for a perfect birthday gift for your partner (who shares your iPad) and you don’t want them to see your searches you can just switch to private browsing to cover your tracks. 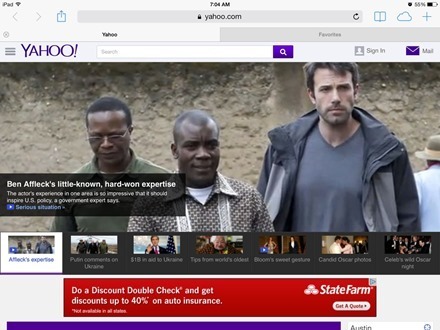 And it’s very easy to turn on private browsing and then swap back to normal browsing whenever you want. 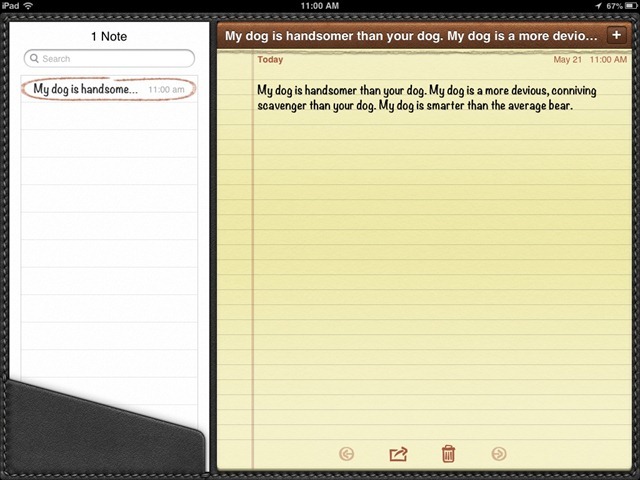 — Tap the + button near the top right of the screen, just to the right of the cloud icon. What do you do if you’ve forgotten the answers to your Apple ID security questions? You know – the ones you set a long while ago and forgot all about and then get prompted to answer every once in a while when trying to install a new app. Or better yet, what do you do when you’ve forgotten the answers AND you no longer have access to your recovery email account that you setup for use with these. That’s exactly the situation I see come up terribly often in Apple support forums – and also one that I experienced first-hand when it happened to my 10 year old daughter. She forgot the answer to one particular security question and had deleted the Google account that was her rescue email. Well, happily the solution is easy and straightforward. You just get in touch with Apple Support and ask for help with Apple ID Account Security. You start by going to this link to find the Apple support page for your country. Then click the link to ‘Start your support request online’. 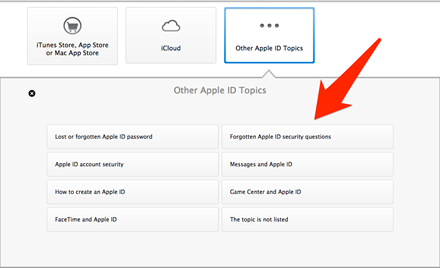 Then you’ll get a list of Apple ID security related topics and can click the one that’s closest to your issue – including one labeled ‘Forgotten Apple ID security questions’. Sharing a Photo Stream, which is a hand-picked collection of your photos in the iPad photo library, is on of the coolest features in iOS. With it you can quickly and easily put together a group of photos and instantly share them to family and friends. 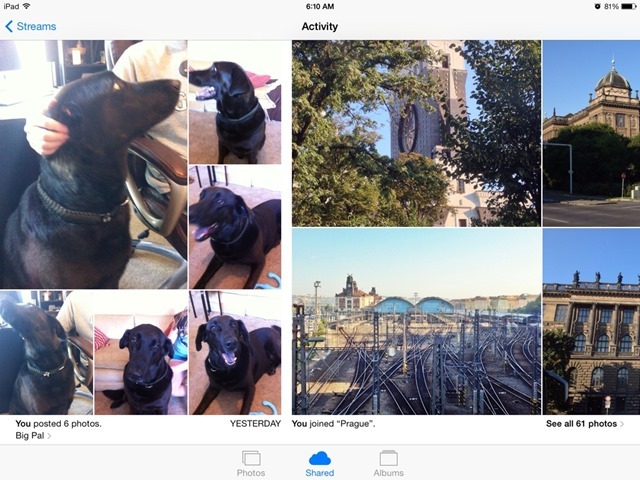 This week I’ve learned a nifty new feature that lets you give the people you’ve shared your photo stream with the ability to add to the photo stream – thanks to an article by my friend Chris at everythingiCafe. — Start with a shared photo stream if you already have one, or create a new one. 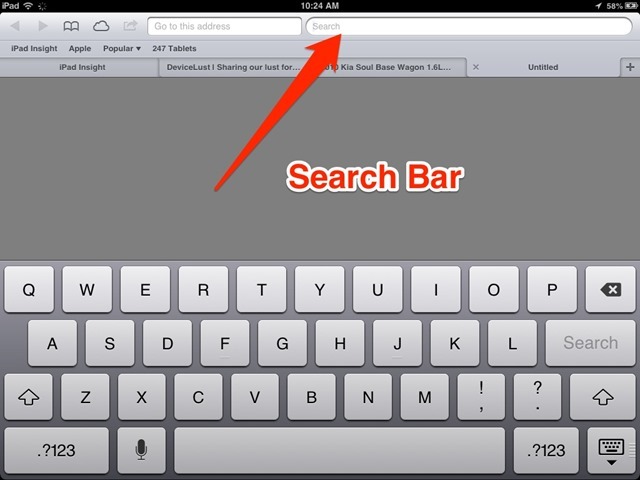 To create a new one, go to the Photos app and tap on the Shared button in the bottom nav bar. Then tap on the ‘New Shared Stream’ button. Give your new stream a name and then choose t least one person to share it with and enter their email address where prompted. 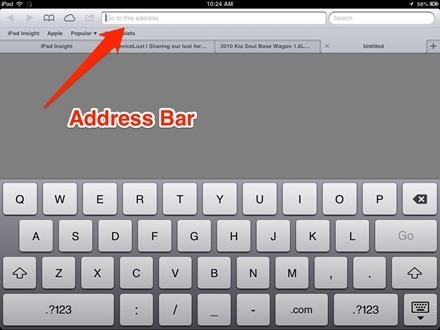 Here’s a simple but handy iPad tip for when you’re using the iPad with a Bluetooth keyboard. If you’ve got Passcode Lock set on the iPad you do not have to touch the home or power button on the button to wake it from sleep mode. In fact, you can speed up the unlocking process by making use of the Bluetooth keyboard. To do so, when the iPad is in sleep mode – just hit any key on the Bluetooth keyboard and then start entering your passcode. Thanks to David Chartier at Finer Things for this one. This is another basic iPad tip and a question I see asked about a lot in iPad discussion forums – how to stop apps or music or books from downloading automatically. Automatic downloads can be very useful – these allow for all your new purchases (which even includes free apps you download) on any device where you have an iTunes account to be downloaded automatically on your iPad. But for some of us they can end up being an annoyance – for instance when you have certain apps or music that you only want on your iPhone. I tend to keep a much bigger music library on my phone than on my iPad, and there are some apps that are really only suited for and useful on a phone device. 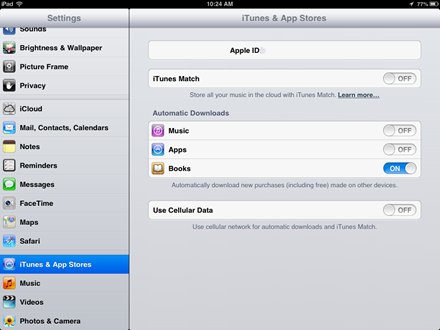 — Open the Settings app, scroll down the left sidebar a little way and tap on the ‘iTunes & App Stores’ section. 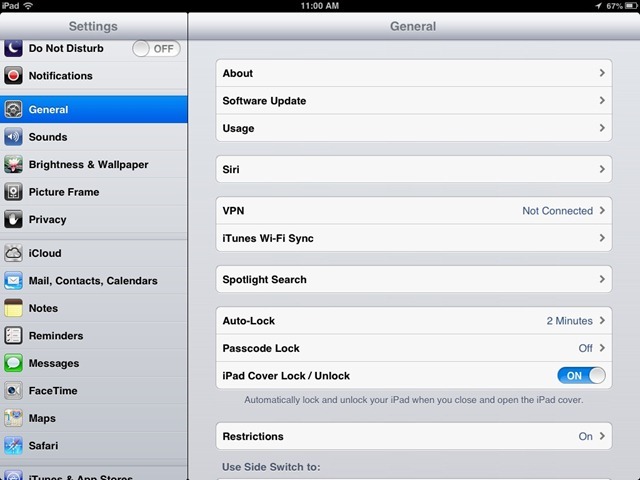 — You’ll see the ‘Automatic Downloads’ settings right in the middle of the screen. 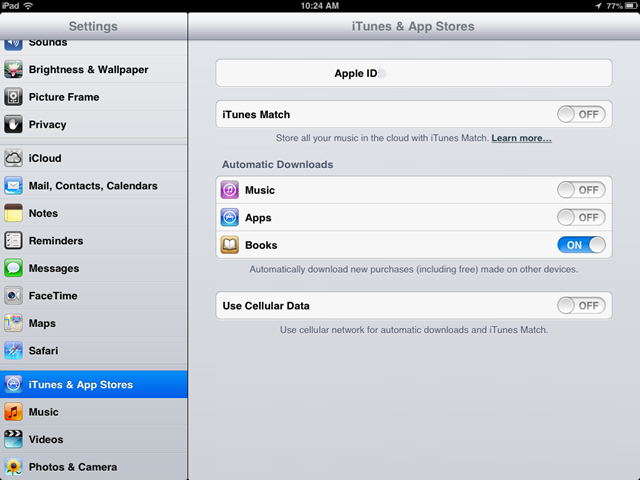 You can tap to toggle automatic downloads on and off for music, apps, and books. It’s as easy as that and of course you can easily change these settings up as and when needed. Here’s a problem that all iPad users have experienced at one time or another: you open an app and it closes right away and returns you to the home screen. Sometimes it’s just a fluke and the app opens properly when you try again, but sometimes the app just quits right away each time you try. — Restart the iPad: Quite often that’s all it takes to resolve this problem and it’s quick to give it a try and either be done and good to go, or move on to the next possible fix. 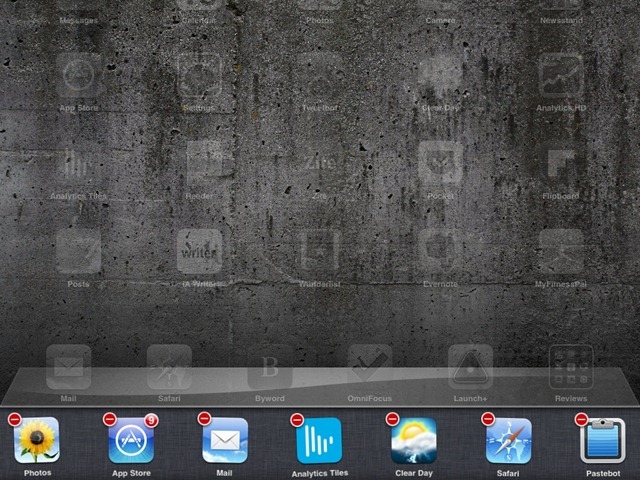 — Open the Multitasking Bar and manually close the troublesome app. 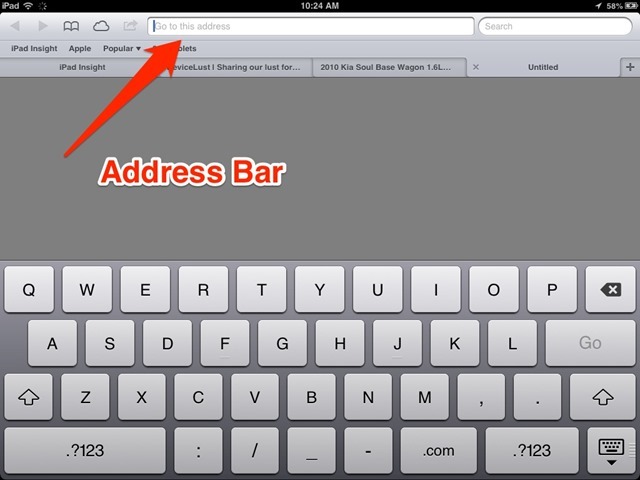 Double-press the home button to bring up the Multitasking Bar, which shows all recently opened apps. Tap and hold on any of the icons in the bar until you see the icons start to wiggle. Then tap the little red minus sign on the icon for the problem app. — Delete and reinstall the app from the App Store. This is particularly appropriate if the problem has occurred right after you have installed the problematic app. This is another quick thing to try, at least with most apps – it will not be so quick with apps that have huge file sizes. Photo Transfer App does just what its name would suggest. It has a easy to use interface with no extra bells and whistles – and just makes it fast and simple to transfer photos between your iPads, iPhones, and computers on a local WiFi network. 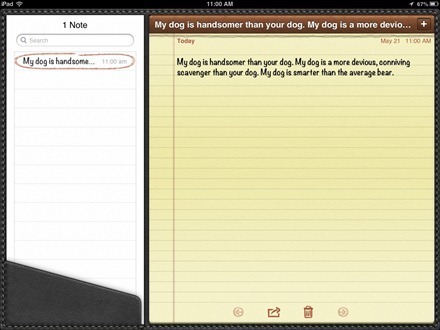 The app costs $2.99 and can be installed on both the iPad and the iPhone. 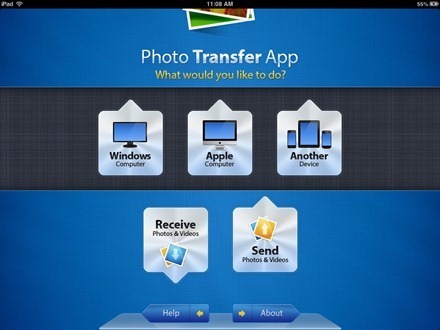 To transfer photos to your Mac or Windows PC you open Photo Transfer App, select the Send button (shown above) and then select which sort of device you want to send to – Windows computer, Mac computer, or another iOS or another device (an iOS or Android mobile device). Then you just follow a simple on-screen instruction to type an address into a web browser on your Mac or Windows PC, select what resolution you’d like to download your photos at, and click a Download button. Just as a quick example, it took around 30 seconds to download a .zip file with 75 iPad photos at full resolution. 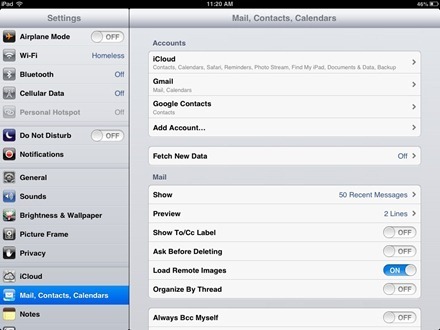 Google has made some changes this year to how Google Contacts sync with iOS devices. For years I had just setup Google Sync as an Exchange account in Settings on the iPad and iPhone and it has worked beautifully for me. It had been especially good whenever I got a new iPad or iPhone – as all I had to do was setup that account and within less than a minute all my Contacts info was up-to-date. 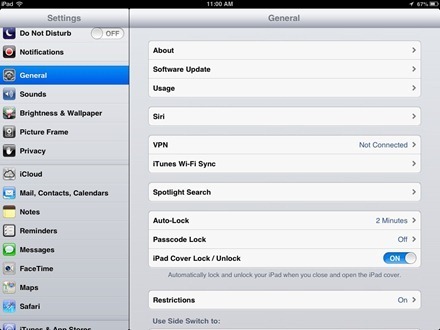 Syncing via CardDAV is only available over SSL for Apple devices on iOS version 5.0 and above. 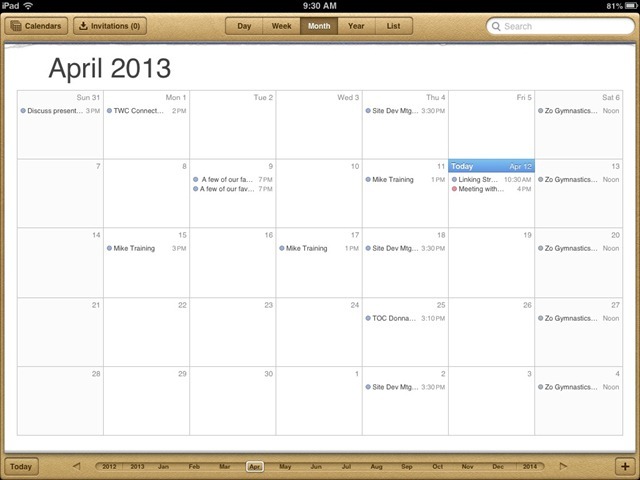 Google has made some changes this year to how Google Calendar syncs with iOS devices. For years I have just setup Google Sync as an Exchange account in Settings on the iPad and iPhone and it has worked beautifully for me. It had been especially good whenever I got a new iPad or iPhone – as all I had to do was setup that account and within less than a minute all my Calendar info was up-to-date. Unfortunately, Google Sync was shutdown by Google in January of this year. 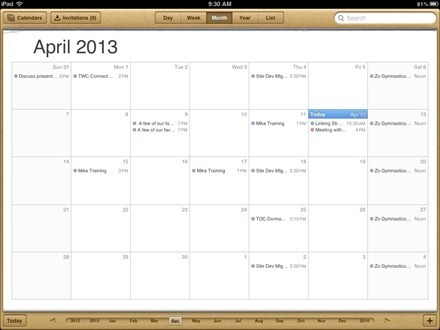 So when I recently bought a new iPad mini I discovered that Google Sync no longer works for Calendar or Contacts. But … there is still a way to sync Google Calendar and Contacts with the iPad – and both are easy to do once you know how. In this post I’ll outline how to get Google Calendar sync working; I’ll soon write another explaining how to setup Google Contacts sync.